Did you ever have something in your stash that you just figured you would never use but when you did you loved it? Today that is me. I had piece of cardstock in my stash that just wasn't me at all...just a color that I could never find a use for....but now I'm in love! Our new theme at Digistamps4Joy is "Add A Birthday Sentiment". I've been working to increase my Birthday card stash so I was ready to get to work. I decided to use a recent release that showed a Paris theme. I knew exactly what I wanted to so then I looked at my cardstock pile sitting in front of me and there it was - that one piece that was old and just crying to be used. I looked past it and was going to use something else but my eye kept going back to that one piece so it was time to figure out a use. The neat thing is - once the card was done - I LOVED IT! Now I'm going to have to figure out where I got that once piece and get more! LOL!!! Before I get to the challenges I'm entering into....I just wanted to tell. you a bit about Digistamps4Joy. If you have never checked out the challenge blog you'll have to stop by - there is always something going on there! And the shop - OH MY! There are TONS of digis in just about any theme you could ever dream of...and new ones added every week! Lastly, the Design Team is quite a group! I have no idea why they accepted me because my crafting level is no where near theirs!! They are so talented!!!! Thanks for stopping by today and spending a few moments with me. God bless you!!! Well It is beautiful! Yes I have stuff that I need to use up too . Such a pretty birthday card! This is SO pretty, Zella. Thanks so much for sharing with us this week, and for taking time to link up and let us enjoy your wonderful art. I hope that your Mom is doing better. She's been in my prayers (as have you). Take care, and God bless you! Very pretty card! I love the colors you used and the Paris theme. Pretty card. Love the image and colours. 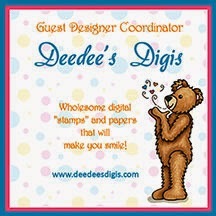 Thanks for playing along at Loves Rubberstamps.